Mention of Rajmachi brings back memories of my past hike done many years ago in full rainy season. We had left Pune in the heavy rains on our bikes around 10 at night, reached Lonavala around 12 at midnight, asked the route of Rajmachi to few people in Lonavala who gave bewildered expressions on their faces and had advised us not to visit Rajmachi in so much of rains. Finally a good fellow riding on the bicycle had shown us the route and also showed us the temple where we could spend night and also generously offered us to let us park our bikes in front of his little home. We tried our best to sleep in the temple in the village with mosquitoes swarming around but could hardly get any and just waited for dreadful night to pass. Finally we had started hike around 5.30 before the crack of dawn. Actual trek was such a pleasure with lush green surroundings, amazing views and many streams flowing across our ways. We even had a blissful bath in the pond on the way and finally reached to Rajmachi; fully exhausted; only to find out that there were two more citadels to climb. Out of 10, we were only 3 who had completed climb to Shrivardhan rest preferring to rest at the base. Right after visiting Shrivardhan, we took the return journey and came back to the village before 7 in the evening. It was really a marathon trek of more than 30 kms which really tested our stamina. And we were non-regular hikers then; so our subsequent days passed in taking care of our sore legs with blisters on them. Considering that I am a regular hiker now, I was keen to do this strenuous hike once again. So when Wild Trek Adventure (WTA) group arranged this trek on 25th Aug, I decided to join them. I was more excited to know that we would be hiking from different and steep route from Karjat region. After my trek was finalized, I got a call from my friend, "Roshan Dusane" who wanted some break from his routine and wanted to join me for the hike. As he hadn't hiked before and had kept himself away from the exercise routine since long, I advised him not to join this strenuous hike but wait for another simple hike later but he was adamant and finally considering his enthusiasm, I relented and decided to take him along. I picked up Roshan from his residence at Baner and we parked the vehicle at Sancheti Hospital and waited for the pick-up bus to arrive. Soon, the bus arrived and we proceeded towards Karjat. We had a small group of around 15 hikers. I was disappointed to know that Prasad Wagh was not leading the trek as he was not keeping well on that day and had decided to rest. I simply adore two fellow hikers with whom I have hiked before; one is "Onkar Oak" and other is "Prasad Wagh". Both are simply great hikers with a lot of knowledge regarding the history as well as geography of Sahydari. You get to learn a lot if you hike with them. After a short travel of two hours, we had a small halt near Karjat for breakfast where few of Mumbai members joined us. Soon we passed Kondivade village and reached to Kondhane village which is the starting point of the hike. Weather was almost clear and it was not raining for a change. Surrounding was majestically beautiful. Already another group had assembled and were ready to start their hike. We soon had a session where members were asked to introduce themselves and number of hikes they had done already. Few of the members were very new and were hiking for the first time. After instructions from WTA members, we started our hike. Rajmachi fort is a strategic fort overlooking Borghat(ghat between Mumbai and Pune) which was a historical trade route. Rajmachi peak has two fortified structures - the Shrivardhan Citadel and Manaranjan Citadel. As we were hiking from Karjat region, we had to climb the height of whole Borghat. Along the way, we planned to visit Kondhane Caves. Soon after starting the hike from Kondhane village, you come across a small ticket counter en route to Kondhane Caves. There is a dirt path that you need to follow with the forest on both the sides. There are many waterfalls and streams along the way. After a short hike of around 30 minutes or so, we had a first glimpse of Kondhane Caves. Well, the sight was stunning! As it was the middle of monsoon, waterfall was in full flow and looking majestic. 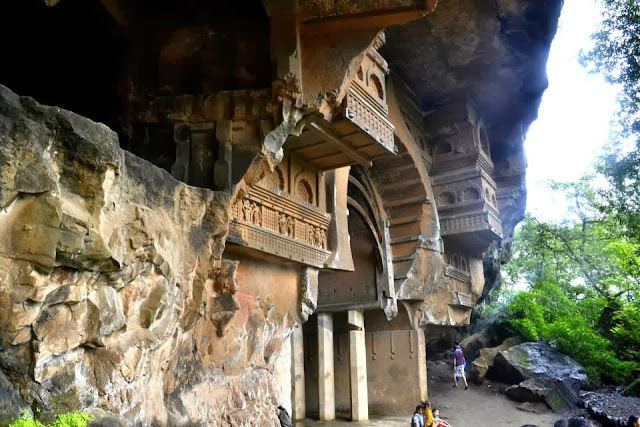 Kondhane Caves: These caves are said to be 200BC-100BC old. Some part of these caves were damaged in the earthquake somewhere in early 1900s; still many of the structures are still intact. Really a place in the real wilderness! After witnessing the magnificent Kondhane caves, we proceeded further. As we were moving forward on the trail, we spotted an alternate left side trail which seemed to go down. Assuming that side trail is not the right one, we continued on the main trail. Trail was entering the thick vegetation and was full of scree. We spotted other hikers/tourists on the same trail who wanted to visit Rajmachi. So we continued on the same trail only to reached to a point where the trail reached to a dead end with vertical cliff in front of us. All of us then realized that we were hiking on the wrong route. Well, this was not a great sign considering that we had some new hikers with our group who were already exhausted with such a steep climb. WTA core members asked us to wait and went in different directions to check whether the correct route was nearby. But finally all returned without any success and we all gradually came down to the spot from where we had spotted the side trail. Believe me, it was horrible to walk down through this scree; many of us were slipping and we had to be cautious at each step. Finally, we descended and found the correct route. There is actually a shoe and bottle tied to the tree which is actually a sign of arrow for the direction to Rajmachi. Some innovative hiker has made this sign which we failed to interpret. Soon we were on the right path that too went through a deep vegetation. It was steep, no doubt and after trudging for another hour, we came to a small plateau and a hut. We just thought that finally we had reached to top only to find out to our dismay that we have climbed just one mountain and there is another to climb. Well, Rajmachi still seemed as distant as the next cosmos. We got splendid views from this small plateau. After climbing the second mountain, we reached to plateau of Rajmachi where a deserted hut welcomed us. My friend Roshan was thrilled to finally have reached at the top and was immensely happy. It was past 2 in the afternoon and we were incredibly famished and desperately needed a square meal. We moved further towards the village where we could get some lunch. Manaranjana Citadel was looking very enticing along the way. Soon, we reached to a group of small houses in Udhewadi village and were informed that it would take at least an hour to prepare the lunch for such a large group. Well, we had two options; either to wait for the lunch to be served or go to visit either of the citadels. We zeroed on Manaranjan as it was small and easy climb. Some members were so exhausted that they preferred to wait rather than venturing for another climb with hunger pangs in their stomachs. Soon, we were on the way to Manaranjan. There is a little signboard indicating the direction to go towards Manaranjan. After following the direction, you need to follow a dirt trail to reach to the top. After climbing for 10 minutes, you come across steps leading you towards the fort. You can see the whole expanse of the fort. Soon we returned to the hut where our lunch was being prepared. Unfortunately, lunch was still not ready and we proceeded towards Udaysagar lake and Godhaneshwar Temple. Trail to visit Udaysagar Lake also goes through the deep forest. This is really part of the country where forest rules. Later, we proceeded to visit Godhaneshwar Temple, an ancient temple of Lord Shiva, built in Hemdpanti Style. Really an unspoiled place of Incredible Maharashtra! Finally, lunch was ready and was being served. Some of the trek-mates who did not come with us to visit Udaysagar lake and Godhaneshwar temple already had finished their lunch. We soon went inside a small house and had our lunch of Tandul Bhakari and Bhaji and Dal-Rice. Though it was not so delicious, we had no other option but to gorge on it. After lunch, we immediately rushed to descend as it was almost close to five in the evening and we had to reach to the base before dark. We skipped visit to Bhairoba Temple and Shrivardhan Citadel due to time crunch. Finally, I along with Roshan and two other hikers reached to the base just when the entire forest plunged into the darkness. Unfortunately, not all had made it to the base and also there was a Mumbai group whom we had met earlier during the trek were still inside the forest. As we had no other option but to wait for other members of our group to come back, we went inside our bus, changed the clothes and just rested. We waited for almost more than an hour and finally all the hikers stranded in the forest came down safe and sound. Story was that hikers of some Mumbai group had lost their way after taking a wrong route and after hearing their screams, WTA core members helped them to safely reach to the base. Choked voices of those stranded hikers profusely thanking WTA group for their rescue was the high point of this hike. I still sometimes shudder to think what could have happened to these hikers in the dark forest had they been not rescued. This is surely a lesson for the hikers that you need to have a perfect plan in place if you are hiking in inhospitable forests. You may not always be lucky to get a second chance to rectify your mistakes. Finally, we started our return journey to Pune and reached Pune around 11 at night. I came back to home around 11.30, had a warm bath followed by a light dinner and went to sleep with the happy thought of the day, incredibly spent. All in all, hiking through the dense forest with many streams crossing our way, visiting absolutely stunning Kondhane Caves, hiking on the wrong route in the total wilderness, the ecstasy of finally reaching to the top, mesmerizing views from Manaranjan citadel and WTA members rescuing the stranded hikers made this hike unforgettable one. One day trek to Rajmachi is quite hectic. Ideal plan would be to reach Rajmachi at evening and do rest of the hiking next day. If you really want to test your stamina, hike from the Kondivade village and return from the normal route to Lonavala. While hiking from Kondivade village, you may get lost because of some misleading paths. Take a local guide if you haven’t trekked on this route before. Don’t miss visiting Kondhane caves while hiking from Kondivade route. Carry enough water as the trek can be quite exhausting. Once again very nice blog Prashant. Thanks for all such virtual tours since people like us are not able to join you in person. Very nice article Prashant. Photos are very tempting to do at least simple trek. Thanks Kanchan for liking the blog! And thanks for the blog...very nice..